Yotsumoto Yasuhiro (b. 1959) was born in Osaka, Japan and grew up in Hiroshima. He started writing poetry in his late teens and published his first collection, A Laughing Bug, in 1991. Since then six collections have been published, including Starboard of my Wife (2006), Conversation Poems: Poetry vs. Living (co-authored with Masayo Koike, 2005), and Golden House (2004). He has won several awards such as the Hagiwara Sakutaro Award in Japan, and his poems have been translated into English, French, Serbian, Romanian and other languages. In addition to poetry, he writes essays, book reviews and short stories for Japanese media. 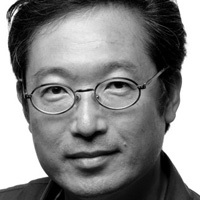 Since January 2006, Yasuhiro has been national editor of Poetry International Web—Japan, introducing contemporary Japanese poetry through English translations (http://japan.poetryinternational.org/). After living for eight years in the United States, he now lives in Munich, Germany with his family. Co-translator Mitsuko Ohno has been a Professor at Aichi Shukutoku University since 1983,and is the author of Yeats and the Tradition of Anglo-Irish Literature (1999), Women’s Ireland (1998), both in Japanese. Co-translator Beverley Curran teaches linguistic, cultural, and media translation at Aichi Shukutoku University in Nagoya.